Samsung will launch the Samsung Galaxy S III in London, England, May 3, 2012. Although in the invitation sent to media Samsung did not mention explicitly, strong suspicion that the event was the launch of Samsung Galaxy S III. In the invitations sent to the site tweakers in the Netherlands, South Korea-based company called the event "Samsung Mobile unpacked". 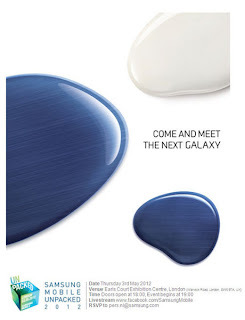 There are listed a a tagline that read "Come and Meet the next Galaxy". Though initially Samsung said it will launch the Samsung Galaxy S III in the middle of this year. After the success of Samsung Galaxy S II, consumers are made curious and looking forward to the continuation of the series Galaxy S II. The news mentions Samsung Galaxy S III will have a 4.6 inch Super AMOLED screen plus a quad-core Exynos chipset. Unlike the previous version, the Samsung Galaxy S II which uses a plastic casing, the Samsung Galaxy S III will use a ceramic casing which makes it look more "graceful". This is similar to the casing that is used HTC One S.